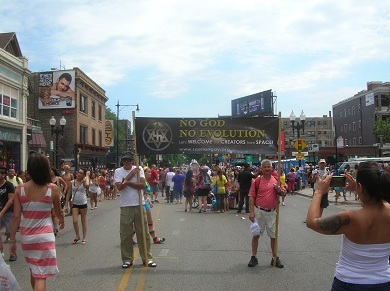 The Chicago Raelians joined the local gay pride to promote ARAMIS, the Raelian Association of Sexual Minorities. Eduardo tells us "Like every year, it was a wonderful and happy experience to be a part of the ARAMIS team at Chicago’s Gay Pride Parade. It was so nice to see so many young people come out to express their sexuality but what really caught my attention was how so many people danced under our banner in support of atheistic ideals. It seemed to me that more and more young people are becoming more and more atheist."